For all you folks in the south sound area. The Washington State Legislature will be honoring Wolf Bauer February 26th at 10:00 am. They are passing a resolution to honor Wolf for all his contributions to the region two days after his 98th birthday! Everyone is invited. Thanks for the note, Jeff. I'd like to attend, but have a previous commitment that day. On the evening of April 9, there will be an event at The Mountaineers in Seattle to celebrate the release of a book about Wolf's life. I'll make sure there is a formal announcement before the event. But interested folks may want to mark their calendars. It's not every day that you have a chance to meet a 98-year-old living legend. Hi Lowell, I'll send you some photos of this event. I know Jim and Lou Whittaker ,Jolene Unsoeld, Dee Molenaar, Larry Nielson, Joe Horiskey and Ed Viesturs and others have all been invited to come. 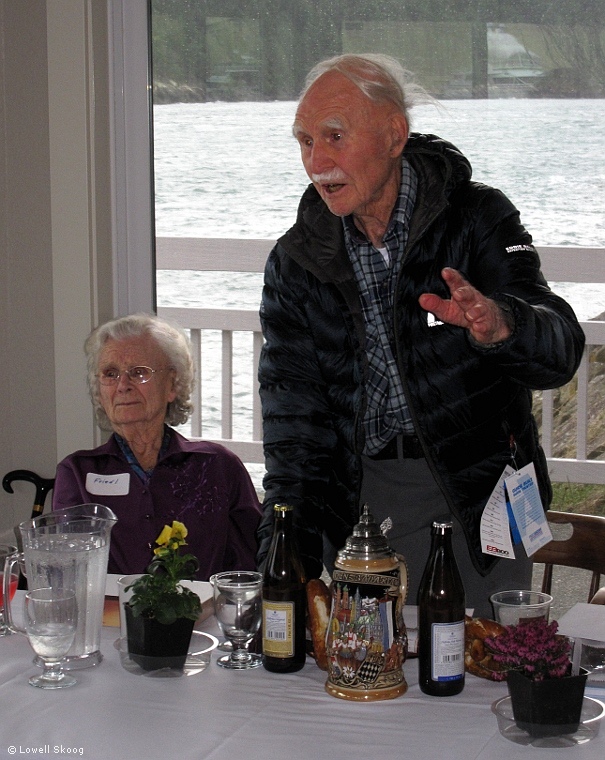 Wolf Bauer (right) and 98 year-old sister Friedl celebrate Wolf's 100th birthday with friends in Anacortes. Representatives of the Mountain Rescue Association presented Wolf with an engraved ice axe commemorating his co-founding of the association over fifty years ago. Dee Molenaar and Jim and Lou Whittaker offered their gratitude to Wolf for his contributions to climbing safety and instruction. Hugh Shipman of the Department of Ecology spoke of Wolf's influence on shoreline ecology in the Northwest. There were several other tributes and warm stories about Wolf's life. Wolf has slowed down a little since his book signing party in 2010 (at which he danced a jig to Dee Molenaar's yodeling!). But he's in good health and as inspiring as ever. We all have our heroes and Wolf is at the top of my list. I really like that photo, Lowell. Go Wolf!